As part of its educational mission, and working through the Education and Training core, NCIBI mentors and supports graduate students and postdoctoral fellows. The core also develops educational materials and training programs, which are then delivered to scientific communities by the Center’s Outreach and Dissemination core. 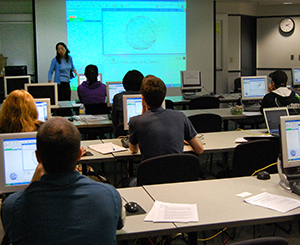 Training, documentation, and tutorials are designed to help scientists use NCIBI systems effectively. To further facilitate productive applications of tools, the Education and Training core takes the lead in assessing user needs; evaluating the usability of applications, the portal, and Biositemaps; and recommending designs for usefulness and usability. To assure user-centeredness, this core bridges and collaborates with the Driving Biological Projects core and the two Computational Science cores. interact with professional developers and learn hands-on techniques for developing robust software. These opportunities have helped numerous graduate students and postdocs complete interdisciplinary research and thesis projects. Center for Computational Medicine and Bioinformatics (CCMB). A number of courses within the program are designed to introduce modern biological sciences and methods to those lacking that background. 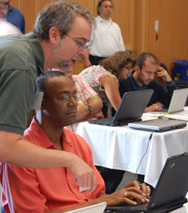 Other courses provide biologists with essential instruction in computer or information science and biostatistics. Postdoctoral fellows are expected to participate in the certificate program as one means of obtaining cross-disciplinary training. These weekly on-site seminars feature topics of interest to scientists, bioinformaticists, and developers. They can be viewed live through a quick click on the NCIBI website. Seminars also are archived and made available on the NCIBI web site for future viewing via Flash video streaming. User documentation designed to assist researchers in efficiently using tools developed by the Center. Tutorials demonstrating tool usage through realistic biomedical cases, available as Flash videos and included in the NCIBI virtual workshop for on-demand training. Training videos accessible through YouTube. Flash demos offering both brief and extended video demonstrations of NCIBI tools for biomedical specialists. Sciences Libraries (HSL) at the University of Michigan and facilitated by a dedicated bioinformationist. Workshops led by NCIBI leaders are held with collaborating scientists from numerous institutions in the Research Colleges at Minority Institutions (RCMI) Network, both on-site at the institutions and at the University of Michigan. As information specialists with graduate training and experience in biomedical, behavioral and biological sciences, bioinformationists provide expertise in licensing, access to digital resources, and literature searches. They also serve as the linchpins in collaborative partnerships between NCIBI and the U-M’s Health Science Libraries. Aided by a bioinformationist, staff members from NCIBI and HSL work cooperatively to deliver instructional workshops on NCIBI tools across campus, at conferences, and at other sites such as the Scientific Library of the National Cancer Institute-Frederick. Additionally, bioinformationists produce workshop manuals, assist with development of NCIBI user documentation and tutorials, and collaborate in the creation of graduate and undergraduate teaching modules involving NCIBI tools. For our user studies and usability evaluations, we employ a variety of methodologies based on the phase of an application’s development. These methods include field studies of scientific users, interviews, and focus groups. They also include scenario-based quasi-experimental usability testing and heuristic evaluations. Results have been disseminated to the larger research community through presentations and publications.